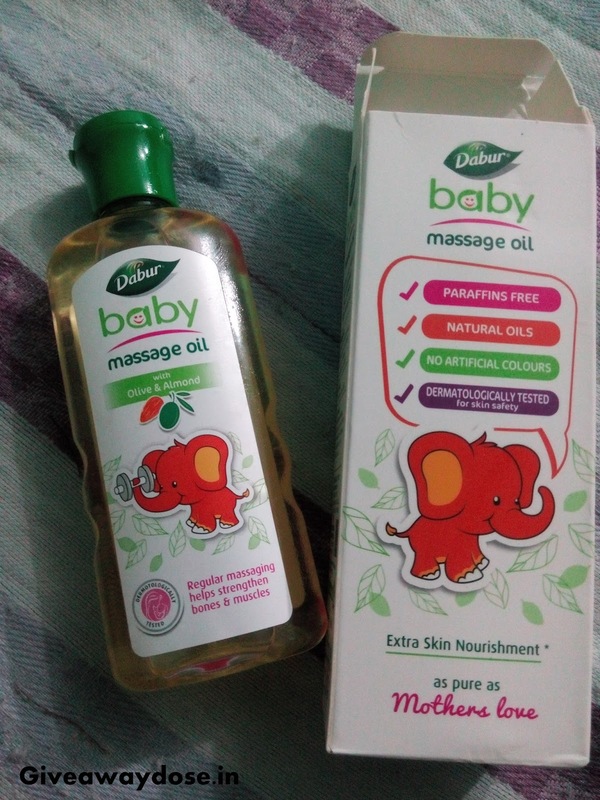 Giveaway dose: Its Dabur Baby Oil Massage Time. Hi All New Moms ! I always wanted the time to fly back, back in the time when I was a just a little child all far away from worries, mental pressures and any other troubles. Those were some days when all you had to do was eat, sleep and again eat and sleep. Yes you got it right I am talking about my childhood. I have become a mom to a little angle shortly and along with her came a flash back of my childhood. Childhood the best time of a human life, yes definitely it is. Being a mom is also special because it indulges you so deep into happiness that you get a chance to re live your childhood with your baby. The childish behavior of your baby gives you an immense pleasure to be a child again. The baby also brings a huge list of responsibilities with itself and my statement doesn’t means that I am complaining but instead I am just pointing out a fact that you are the eye, ear and everything to your child and it is you who understands the needs and the requirements your child. It is so true that being a mom is not a simple and easy thing at all but one thing is for sure nothing can make you happier than giving your baby all you can and the best you can in all possible ways. We all try to provide our babies the best comfort available and we do anything to accomplish our goal. I give my baby the best I can in each and every way the best cream, the best and comfortable bed, the best soap and each and everything the best available. But today I am here to talk about the best oil that you can use for your baby. Oiling you baby three to four times a day is a mandatory task and it provides the physical strength to the baby. 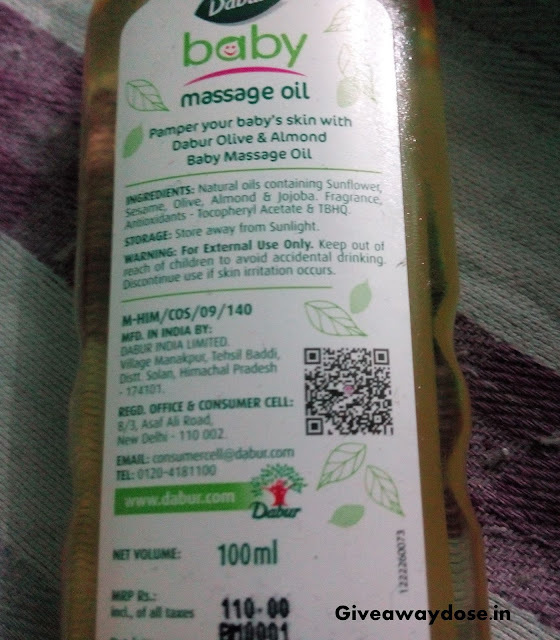 The oiling helps the baby in many ways such as it strengthens the skeleton on the baby, it keeps the baby screen moisturized and soft and it keeps the baby fresh and fit. The more you oil your baby the healthier it gets day by day. The bones or the skeleton on the baby gets its main strength from the oiling and it helps the bay to toddle, stand and walk respectively. I have been using mustered oil on my baby as it is the best natural oil which posses almost every required elements for the growth but recently I came across this Dabur baby massage oil. It has everything in a complete ratio which a baby oil should have and thus I found a good and suitable replacement for the mustered oil I was using. The proportion of the elements has been set so well. The main ingredients of this wonderful oil are sunflower oil, olive oil, sesame oil and jojoba. The oil has a beautiful fragrance and lives a sweet smell on the baby after being applied. The effect of the oil is soothing and it helps the baby in comfortable long sleeps and it also keeps the baby fresh. The oil does a lot other things apart from providing strength to your baby. This oil is a highly recommended one and being a mom I too recommend the oil to other moms. It works wonder on my baby and I am sure I will do the same for other moms and babies too. Aw...your baby is just so precious :) Thanks for sharing this review with us.